Update: The following is the actual four felony charges in this case, defendants middle name is not a misprint. 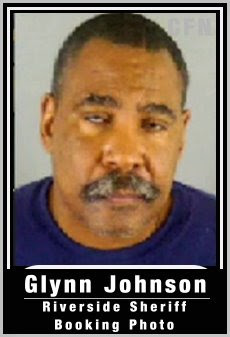 Update: The Arraignment hearing for Glynn Johnson has been scheduled for January 13, 2009 at 1:30pm in Dept. 31. Glynn Johnson does have to appear personally. This will be at the Riverside County Courthouse 4100 Main Street, Riverside, 92501. Los Angeles County Fire Department assistant Chief Glynn Johnson was arrested for Felony animal cruelty. He was taken in handcuffs from his home. Have the wheels of Justice began to turn after six weeks of Investigation? 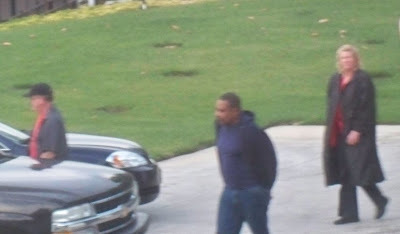 with the suspect Johnson earning Fire Chiefs pay sitting at home on administrative leave. Low Ball bail: Bail has been set at $10,000. No arraignment has been set yet. Riverside County sheriff's detectives believe a Los Angeles County assistant fire chief committed animal cruelty crimes in the beating death of his neighbor's dog, a sheriff's captain said. Now the District Attorney apparently concurs. 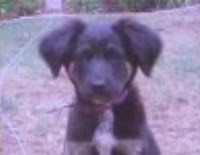 Chief Johnson is accused of beating a neighbor's six-month-old shepherd mix dog, Karley, so severely a veterinarian had to euthanize the puppy. Johnson is said to have hit the puppy, named Karly, with his fist and a 12-pound rock. Karly was later euthanized because of the severity of his injuries. Johnson says the dog nearly bit off his thumb and that he acted in self-defense. But a witness says the attack was the result of a violent outburst from Johnson. In recent weeks, animal rights activists and the puppy's owners have launched a campaign seeking criminal charges against Johnson. Last week, dozens of protesters rallied outside the Riverside County DA's office to demand charges be filed against Johnson. Veterinarian stated that the puppy had a crushed skull, crushed ear canals, severe eye damage, and brain damage, etc. At about 4:00pm today Glynn Johnson was arrested and charged with FELONY ANIMAL CRUELTY CHARGES. He was taken in handcuffs from his home. Thank you so much everyone for your help and your support. We couldn't of done it without all of you!!! How fitting that his AKA name is Glynn "Demon" Johnson. Check out the Riverside County Superior Court site for this information. This man should go to jail for years and have his head bashed in too. He should lose his job, no pay. No benefits. At the ABSOLUTE MINIMUM he should lose his job and serve at least 4 years. What a disgrace, should be setting examples in his position. What a 'big' man he is, bashing a little defenceless puppy!! How much could Karly have "supposedly" hurt him? look at the size of this pathetic excuse for a human being, and "if" she did bite him, it does NOT justify the brutality of his actions!!!! he should lose his job, without pay, and spend at least ten years injail where he will get what he deserves!!! No Sympathy what so ever! !